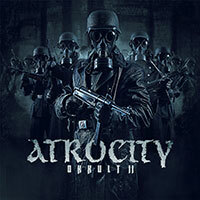 This is how you can join the treasure hunt: There is a hidden numerical code in the booklet of the limited edition digipak and the iTunes download of the new ATROCITY “Okkult” album. The numbers form a letter code, which is the title of the hidden song. Once you have deciphered the title, you can enter it and log in on the ATROCITY website and find more details about the treasure in the form of a 24 Karat golden CD, including the song. Then the quest begins! “This treasure hunt will be great fun for music fans. In the age of illegal downloads this should show the value of music,” says Alex. “It’s usually very easy to download songs via various platforms. This track, however, is unique and you have to do something to get it.” Of course, the excitement and the fun to participate in an adventure like this is in the foreground. The salvage of the “Grand Prize” will certainly be a valuable treasure if alone considering the production costs. “For us, it’s really been difficult to opt for the hidden song, due to the fact that there were heated discussions within the band (laughs). We don’t have the song any more, all master files and recordings are destroyed!” Therefore, Alex calls for the adventurous treasure hunt! In the end, there should be a worthy finder, because it is a not a quite so simple task. The treasure hunt can and should also be documented by fans. “Film yourself in action, make photos or just write about it. You can also make treasure hunter groups on facebook, no matter what. We would be very happy to see you join this completely new form of geocaching. Together with Sonic Seducer we’ll publish and update your particpation. For “Okkult II “and” Okkult III ” there will be a continuation of the treasure hunt. However, the songs will no longer be hidden in Europe but on other continents. Have fun with the first metal treasure hunt world-wide! 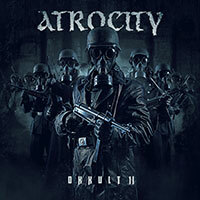 Und so könnt Ihr alle mitmachen: Im Booklet der Limited Edition Digipak und im iTunes Download des neuen ATROCITY “Okkult” Albums ist ein versteckter Zahlencode. Die Zahlen bilden einen Buchstabencode, der gleichzeitig der Titel des versteckten Songs ist. Sobald man den Titel entziffert hat, kann man diesen auf der ATROCITY Website eingeben und erfährt weitere Details zum Aufenthaltsort des Schatzes in Form einer 24 Karat goldenen CD mit dem gesuchten Song. Dann kann die Suche beginnen! „Diese Schatzsuche soll ein großer Spaß für Musikfans werden. In Zeiten von illegalen Downloads gleichzeitig auch ein kleiner Denkanstoß zur Wertigkeit von Musik “, erklärt Alex. „Es ist normalerweise relativ einfach über diverse Plattformen Songs runter zu laden. Diesen ganz speziellen Song gibt es allerdings nur einmal und man muss etwas dafür tun, um ihn zu bekommen.“ Der Spaß bei so einem Abenteuer mitmachen zu können, soll dabei natürlich im Vordergrund stehen. Die Bergung des “Hauptgewinns” wird sicherlich ein wirklich wertvoller Schatz sein, wenn man alleine den Produktionskostenaufwand bedenkt. “Uns ist es echt schwer gefallen uns für den verborgenen Song zu entscheiden, da gab es auch heftige Diskussionen innerhalb der Band (lacht). Wir selbst haben ja den Song auch nicht mehr, alle Masterfiles und Aufnahmen sind zerstört!” Daher ruft Alex zur abenteuerlichen Schatzsuche auf! Am Ende soll es auch einen würdigen Finder geben, denn ganz so einfach wird es nicht. Die Schatzsuche darf und soll auch gerne von den Fans dokumentiert werden. „Filmt euch bei der Aktion, macht Fotos dabei oder schreibt einfach darüber. Ihr könnt auch Schatzsuchergruppen auf Facebook bilden, egal was. Wir würden uns sehr freuen, euch bei dieser völlig neuartigen Form des Geocachings mitmachen zu sehen, und werden das auch gemeinsam mit Sonic Seducer dokumentieren und veröffentlichen!“ Für “Okkult II” und “Okkult III” wird es dann eine Fortsetzung der Schatzsuche geben, allerdings werden die Songs dann nicht mehr in Europa versteckt sein, sondern auf anderen Kontinenten. Viel Spass bei der ersten Metalschatzsuche der Welt!